Have you ever pulled out your favorite suit to wear when it was blazing hot outside only to realize after drenching the suit in sweat that this may just be the wrong suit to wear this time of year? Truth is, most of us men have experienced this whether it be at a summer wedding, during a business meeting held in the summer or perhaps at a dapper summer party. Now that the weather has seriously warmed up, it is important for the style-conscious gentleman to pay just as much attention to what he wears now as he would during colder seasons. And plus, with it being so hot and sometimes unbearably humid in certain areas of the country, it's easy to become slack in maintaining season-appropriate personal style. 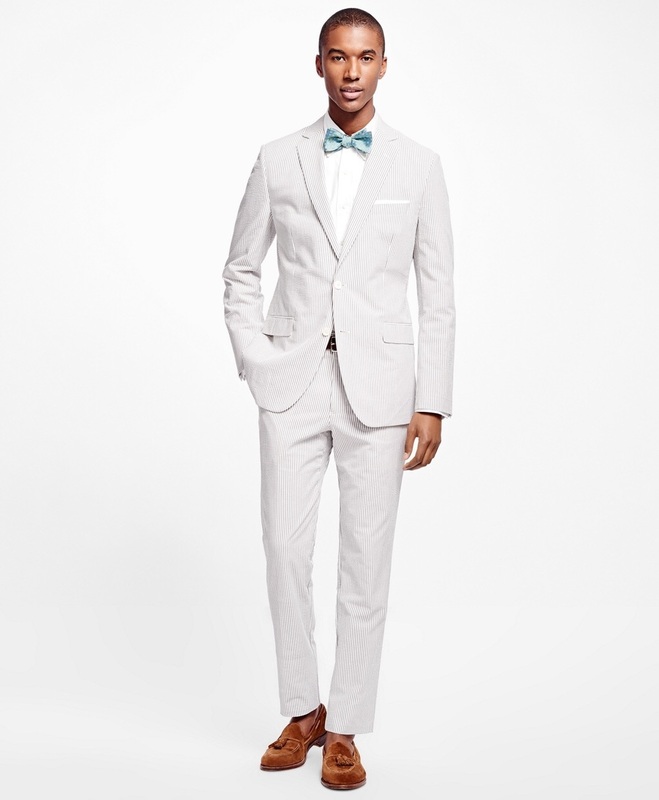 But fret not, I've got that #SummerSuit guide for you brothers who want to do it right! So my disclaimer about linen suits before I get into this is to admit that I'm not by far a huge fan of linen anything. As most people feel about linen, I just can't stand the fact that it wrinkles so easily and not to mention the fact that I am utterly terrorized by the memory of men wearing those two-piece linen suits in the bright colors. And yea, I was one of them, but I got delivered! Now, linen suits are definitely cool and light-weight, which make them the iconic choice for summer suit wear. On the other hand, I would suggest that if you want to wear one of these material suits and are concerned about it becoming a distraction for being overly wrinkled, that you seek for a linen blend suit which may include wool or cotton. This is particularly the right direction to take if you choose to wear it for work which will give it a fuller look overall. My first pair of seersuckers were a pair of Polo Ralph Lauren's I got on sale at Dillard's and still wear proudly to this day! Seersucker is a very distinguished material, which is light-weight and yet commands a certain respect when put together right. Seersucker is such a staple item to own that it makes for the perfect shell to pair with a simple white button down Oxford shirt and nice pair of brogues, monk-straps or loafers. Likewise, you will often see more daring men versed in fashiondom wear seersucker with a pair of chucks or low-top all-white or khaki sneakers. When I see gents decked in seersucker suits, it reminds me of guys and gals dressed up for the Kentucky Derby or some elegant outdoor summer party. Cotton suits are one of the most common suits that men can wear both during the summer seasons as well as the cooler seasons depending on its lining interior. Cotton is a great material for air ventilation and conforms just right on the body. Another thing that I won't spend a lot of time on for this post is the fact that you can get away with wearing more adventurous colors during the summer. As with cotton suits, it's a great idea to step out the box and choose a lighter color such as grey, light blue or pastel shade for starters. And when you've mastered that, give a try to wearing a more vibrant color like red, green, etc. The last suit selection that I wish to cover is this big trend in shorts suits. If you want to pull this off, you've got to come correct. First, it is important that the suit coat be a tailored and fit as to not look like an experiment gone wrong. The sleeves are to be long just as it would be on a two-piece pants suit. The only difference is, the shorts are supposed to be hemmed just above the knee. Anything else, is a definite fail. So, if you want to try wearing a shorts suit for the first time, I would definitely recommend looking at some other images of men in this look as seen marketed in upscale men's magazines or runway shows. In conjunction with the run-down of different summer suits I've mentioned, there are several others out there that time will not permit me to delve into right now. I do recommend however, that you also check out my article on fashionado.net about going sockless in the summer entitled Socks or Not? as this is the perfect opportunity to do so to top off your summer suit ensemble. Again, in fashion, it is always a matter of doing things the right way the reason educating oneself on the subject is most important.